Welcome to our website! The site is packed with information about who we are, what we do and where you can find us... so please explore! Our documents page contains lots of information including info leaflets and letters. In terms of day to day school life, the most up to date info on current and ongoing events in school is to be found on our social media pages on Facebook and Twitter. Many thanks to all who expressed an interest in our school. We wish you well with your application. Applications for Pre School and P1 for September 2019 are now closed. Late applications can be submitted in paper form and forms can be accessed via the link below or by contacting schools. Please note that late applications cannot be considered until all on time applications have been processed and parents informed of outcomes. 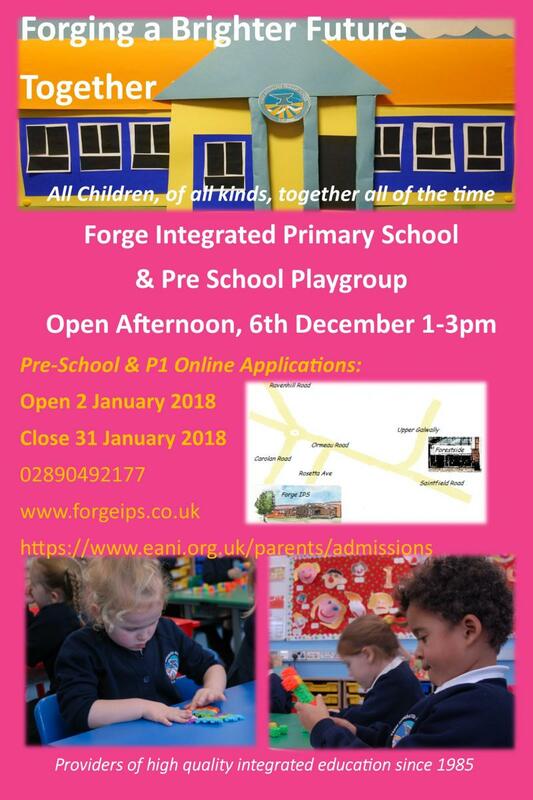 As an Integrated setting we also need parents to complete and submit a FIPS (Forge Integrated Primary School) Pupil Information Form. Hard copies can be obtained from the school office and downloaded from this website. Hard copies should be returned to the school office. Our Pre-School Playgroup was most recently inspected in November 2017 and the report can be viewed at https://www.etini.gov.uk/publications/pre-school-inspection-forge-integrated-playgroup-belfast and also here. Forge Integrated Primary School was most recently inspected in October 2016 and the report can be viewed at www.etini.gov.uk. A copy is also viewable here on this website. School inspections are intense and rigorous and we are very pleased with the affirmation these reports provide for us as hard working, high quality providers of Pre-School and Primary Educaton in an Integrated setting. As we look at the long term development of our school we are working with the Education Authority and the Department of Education to ensure that we have suitable accomodation to meet the needs of the children we serve. The three strand proposal has now been published and can be viewed on the Education Authority Website. We have measures in place to keep parents informed of the school's actions in the event of severe weather. Check the Info Leaflets section of our documents page for details! THANK YOU for your sensible driving and parking. Please remember to take great care as you drive along Rosetta Avenue, Carolan Road and through Wellington College. There are large numbers of children and young people on foot at peak times. Please be very alert to where the zebra crossings within the Wellington site are and take great care when driving over them. We have had reports of drivers continuing over the crossings when pedestrians have already set foot on them. We've also heard of vehicles being parked in such a way as to obscure drivers' view of the crossing or block pedestrian access to it. DON'T DO THIS! To all those parents, pupils, staff and associates who completed our School Evaluation Survey. The results will feed into our School Development Plan and we hope to publish a summary of the survey results and the new developement plan in early October. We are encouraging as many parents as possible to register for our text & email update system and to follow our Facebook and Twitter feeds. It saves paper, reduces the cost of copying and cuts down on the frustrating 'Lost Note Syndrome' that afflicts so many of us! Get in touch with us at the office and make sure we have valid mobile phone and email details for you. We do want all of our online lives to be safe and comfortable and we have a number of policies regarding the use of IT and the internet in school. Social Media is a great way to communicate if we make sure we our conduct is positive, polite and age appropriate. Parents who do wish to engage with us via social media should read our Forge on Facebook policy. Please take on board the spirit of this policy and note that while Facebook steals the glory in the title thanks to its alliteration potential it also applies to Twitter!